PUBG winners can now have a chicken dinner after securing a win and not worry about getting their controller greasy. 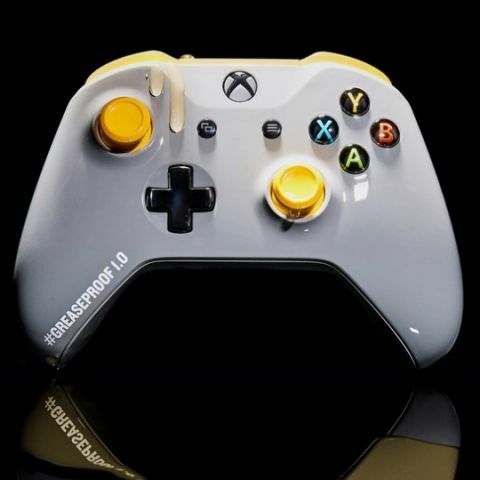 PUBG recently got its full release on Xbox One and celebrating the occasion, Xbox Australia has announced a “PUBG Greaseproof” edition of the controller. The company has developed the new edition in collaboration with ColorWare and it is made with a coating of urethane on top, which not only makes the controller greaseproof, but also scratch and water resistant. However, as the coating is only external in nature, the Greaseproof 1.0 Xbox controller is not waterproof. The accessory could be a perfect companion for those who want to keep snacking while aiming for that chicken dinner and not worry about getting the controller greasy. Unfortunately, the new Greaseproof edition of the controller is extremely limited as only 200 are being manufactured and shipped around the world. Additionally, in Australia, only 10 of them will be sold and those who want one will need to keep an eye on the company’s Facebook page. There is no information on when the device will go on sale but Xbox is expected to soon announce this and availability of the new controller for other regions as well, so it will be a good idea to keep a watch on the company’s various social media channels. Speaking of chicken dinners and PUBG, the PC version of the gaming title recently got the Update 21. It not only adds the Training Mode map to the PC version of the game but also introduces a new weapon, vehicle, weapon attachment and brings the usual slew of bug fixes. The new training mode is just 2x2 in size so that two players can duke it out and try out different skills. Additionally, they will not die while playing in this mode as the developers state that the HP will not drop below 1. The MK47 Mutant assault rifle is also added with the new update and it is available in all maps. It uses 7.62mm rounds with a capacity of 20 bullets and offers single and 2-round burst firing modes. You can read about all the new features that have been rolled out with the update here.